6 Essentials Every Night Shift Nurse Desperately Needs! One of the biggest adjustments after the birth of my twins was going back to work. For many reasons, I had to return to work full-time, which for me is 40 hours/week. I work as a nurse practitioner in a level I trauma center emergency department. Fortunately, this means that there are 24/7 opportunities for me to work. I made the tough decision, after being back for a few months, to switch to permanent night shift staff. I’ve since dropped down to part time after paying off my student loans, but I’ve stayed on nights contract. In order to be on your game while at work, especially at night, it is crucial to be well rested before and after your shift. I did a lot of research on how best to execute a quality sleep routine, especially because my babies are home while I sleep (and I cannot be a good mom or a good ER provider if I’m not well rested). 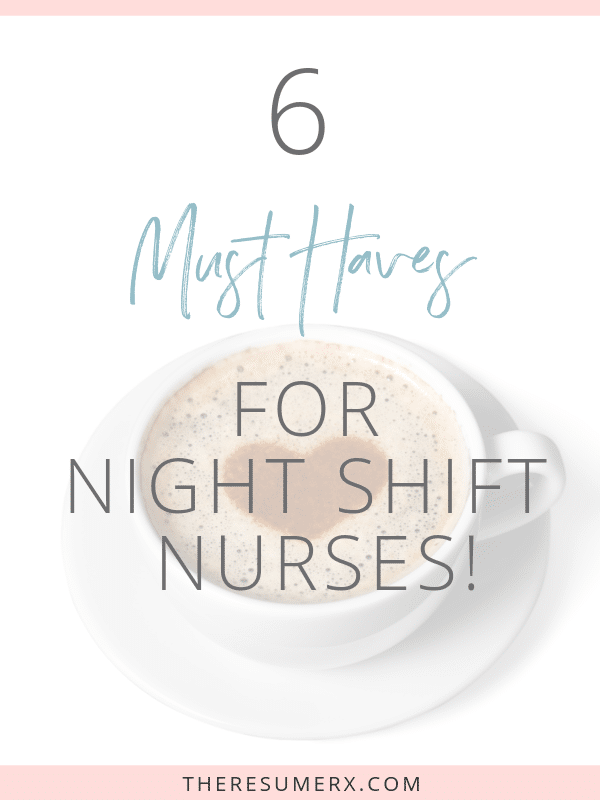 Without further ado, here are my six MUST HAVES for night shift nurses! 1 — Bedtime Bliss Sleep Mask: A quality sleep mask is essential to restorative sleep during the day. Even if you have blackout curtains, there will inevitably be light that peaks through. This mask is my favorite for many reasons. It is contoured such that you can open your eyes without your eyelids or lashes brushing on any part of the mask. There is an adjustable velcro strap. It comes with a carrying pouch and a bonus pair of foam earplugs! Not to mention, the price is right, it’s highly rated on Amazon.com, and ships in 2 days if you have Amazon Prime. Duh. 2 — Drift to Sleep Ear Plugs: The pair that comes free with the Sleep Mask is great, but they are meant to be disposable. These ear plugs are very similar and even nicer in quality, in my opinion. The box comes with 20 pairs (this could easily be a year’s supply! ), a sweet plastic carrying case (perfect if your dog thinks earplugs are snacks), and they are a sweet shade of purple. Also, all the same price and Amazon.com benefits as above! 3 — Marpac Dohm Sound Machine: Confession. I stole this white noise machine from my innocent twin girls. If you sleep in an empty house during the day, you likely do not need this item. However, if you sleep down the hall from one or more enthusiastic, squealing children, then this item is for you! It is a top baby registry item, and the item itself is quite simple. It’s a fan. With a plastic casing over top with different holes in it. You can turn the plastic casing to change the tone of the fan noise. I wish I had invented this genius product. But alas, here we are. It is crucial to my daytime sleep quality. We’ve taken it with us when staying with the girls in a hotel, which was great for their sleep and also hopefully helped drown out their squeals from other hotel patrons. The company also makes a portable version. 4 — The Perfect Beverage Holder! Hydroflask: Many will tell you that aside from sleep, the second most important key to surviving night shift it to stay hydrated (and not just with coffee). This is a no-nonsense water bottle, made of double-wall vacuum insulated stainless seal. The claim is that it keeps your hot liquids hot for 6 hours and cold liquids cold for 24 hours, and I can absolutely vouch for that. It has kept my ice frozen for 24 hours. What??? I get many compliments on this item, multiple times per shift, actually. I got the 40oz version as a gift, and changed out the screw top lid for the straw lid. Bonus, it is quite heavy when full, and as such can serve as a self-defense weapon if necessary. make Aeropress coffee at home in YETI. Drive to work and drink the coffee. Get to work, finish the coffee. Rinse out my YETI and fill with ice water, drink. Repeat step 4 until end of shift. 5 — Erin Condren Planner: I may or may not sleep with my planner under my pillow…I’m that girl. What can I say, my husband and I work full time, I have two young children, and I never really know what day it is. My planner continues to save me from the errs of mom brain. I am on my fourth Erin Condren Planner and I’m quite obsessed. The first two I had were Life Planners, which included both monthly and weekly spreads in a coil bound planner book (such an understatement–check out all the details and goodies!). My third planner was a Basic Monthly Planner: a bound book that features monthly spreads only, followed by note pages. However, after an unfortunate spilled coffee incident, I retired the basic monthly planner and replaced it with a Deluxe Monthly Planner. I certainly favor the Deluxe to the Basic, as it includes a few list pages in between each monthly spread, which is perfect for my style. I no longer need the weekly pages, and I am always working off an ongoing to-do and to-buy list. Furthermore, the covers are customizable and there are so many accessories that will warm your sticker loving heart. 6 — Melatonin: I have absolutely no trouble falling asleep after a night shift. Arguably, it’s the best sleep I get! However, I try my best to take at least a 3-hour nap prior to my first night on, and that can be tough with little ones. I’ve found that low dose Melatonin has been helpful for me to fall asleep quickly and wake without feeling groggy. I will also take a tablet before going to sleep in between night shifts, as sometimes I have trouble sleeping past a certain time. I keep the chewable/dissolve tabs on my nightstand. There you have it! These are the top 6 must-haves that I use on an almost daily basis to achieve sanity as a night shift nurse. Got a question about working nights or have a tip for quality sleep-life balance as a night shift nurse?